Due to our busy schedules, we want to spend as little time as possible in ironing our clothes. If you are looking for an alternative for the traditional iron, you can choose to use a steaming iron instead. Steaming irons are much faster and convenient than irons since they are lightweight and the smaller ones do not need that much space. Steam gently relaxes your clothing’s fibers, which is perfect for garments sensitive to ironing like satin, silk, polyester, and lace. It takes wrinkles out of delicate clothing, while not letting you worry about burning your clothes. You can also use a steam iron on fabrics such as suit jackets, clothes with pleats, and screen-printed shirts that are difficult to iron. If traditional irons can only flatten certain parts of the fabric while leaving out other areas still wrinkled, the garment steamer can reach the underside of clothing as well as other inaccessible parts of your clothes. Any fabric that has been flattened out can regain its body and volume with this amazing tool. Simply put, a garment steamer makes an outfit look good and pressed without you spending too much effort. Looking for the most suitable garment steamer that you and your family can use? We have prepared for you a guide to help you choose the best modern steamer. But first, a look into the different steamers that you can choose from. These are very handy and useful for people who always travel. They can be carried and stored in backpacks or suitcases for long journeys. Because of its compact size, it is easy to store and used right away anywhere you go. 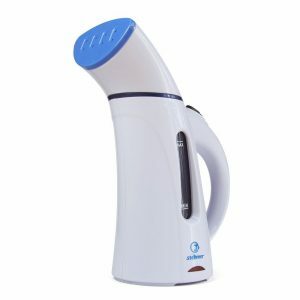 The typical handheld steamer consists of a built-in water tank and a steaming nozzle. Most people who purchase handheld steamers prefer them because of their ergonomic functionality. Can clean furniture upholstery, plastics, linens, ceramic, etc. 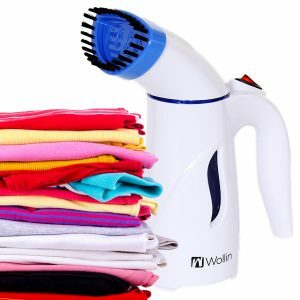 These steamers are bigger and can give you the ability to steam more clothes at one time. These sit on the floor and are designed specifically for vertical steaming. They usually come with a visible tank for water heating, an ironing brush and steam hose, and an adjustable hanger. Stationary steamers are suitable for homes and professional use. Can iron different types of clothes like wool, knitwear, synthetic, etc. Most solid, durable and long-lasting than other types of streamers. Think, industrial grade. They are suitable for home and commercial use and offer Dual heat technology for faster and hotter steam. 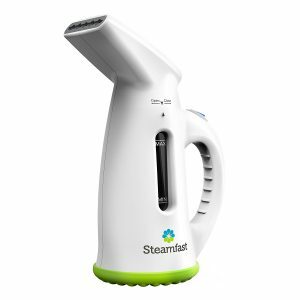 The typical professional steamer comes with a collapsible hanger, a height-adjustable pole, a wheel system, as well as additional attachments and brushes. Some of these steamers also have a built-in Steam-On-Demand technology to allow you to pause steam whenever you need to. Now that you know the different steamers available, here is a review of the top 10 garment steamers of the year. This product gives you the flexibility to steam and iron at the same time. 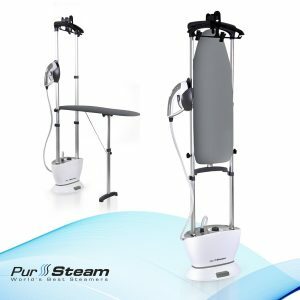 With an ironing board that comes with the steamer stand, you have the option to iron clothes the traditional way or use the steamer with clothes hung upright or placed on top of the board. Its one-touch steam button can also control the high-pressure steam for you. It keeps you safe from burns and other accidents with its burn prevention cap. Get to experience long continuous steaming for 30 minutes with the steamer’s 1-liter water tank. You are given two options in one because of its hanger and ironing board. 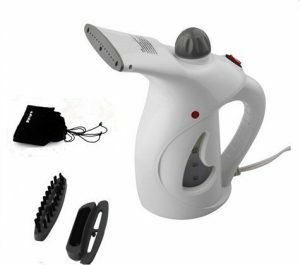 This product provides you a steamer that also works well as an iron. Thanks to its huge water tank size, you wouldn’t need to keep refilling water right away. Despite the compact design of the ironing board, you can still get great functionality and extreme efficiency. Plus, the unit is easy to fold and tuck away which makes the experience even more convenient for you. 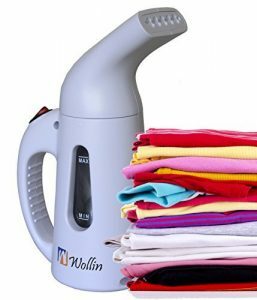 This portable steamer can remove those stubborn wrinkles from the most delicate of garments, while delivering enough power to penetrate heavier fabrics. It has a removable nozzle that ensures fabrics are steamed evenly and can give you easy access to its 11.35-ounce water tank. You can also use the steamer continuously for a longer period of time with no need to pump or press any buttons – water is heated right away in 2 minutes! Its handheld design makes it comfortable for everyday use. It can freshen your clothing and other fabrics without the use of harmful chemicals. You also do not have to worry about the steamer slipping when it’s set down on any surface, what with its non-slip silicon base. If you prefer to steam clothes with more flexibility, the Steamfast SF-445 Compact Fabric Steamer is the right one for you. This garment steamer saves you time with its fast heat-up technology. Its large water reservoir capacity allows you to continue steaming for 10 minutes. You can bring this lightweight and comfortable product with you whenever you travel. Now you do not have to worry about traveling with wrinkled clothes. Let your clothes look crisp and sleek with this high-quality steamer! It’s handy, portable, and easy to fit in a suitcase. Even with its small size, it can effectively remove wrinkles on any fabric. Its ultra-fast heat-up process would be fit for people with busy lifestyles and who are constantly in a rush. Plus, the garment steamer’s power cord is long enough to give you an extended reach. 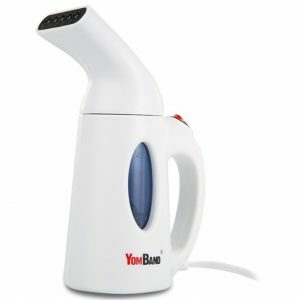 This garment steamer heats up within 15 minutes and delivers 1500 watts of steaming power. Steam will be produced once it reaches the preheat temperature usually within 2 minutes. With its sight gauge, you can also easily view water level and whether or not there is sediment build-up. Its highly durable design and quality metal accessories keep the product from deteriorating fast. Its 7.5 flexible foot hose makes it convenient for steaming objects in high-up areas, such as curtains. You can also easily see the water level status because of the steamer’s sight gauge. 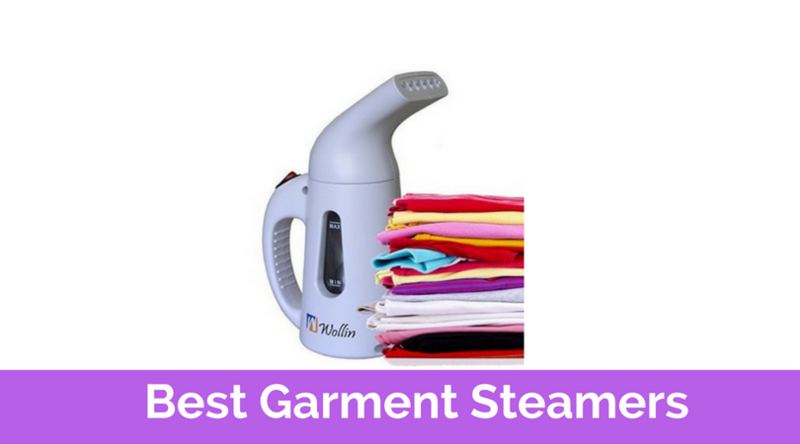 If you are looking for a durable and high-quality steamer for your home, then this is the perfect product for you. Smoothing out all kinds of fabric is what this product is made for. If you press the ‘I’ button, it would heat within 20 seconds and give you a working time of 8-10 minutes. The ‘II’ button, on the other hand, will heat water up in 45 seconds with a working time of 18 minutes. When the unit becomes too hot or if the water level goes too low, the steamer automatically shuts off for your safety. The garment steamer quickly warms the water and can do the work for you in no time. People who travel can easily put it in the travel pouch that comes with the package. You will not be disappointed, as it can remove wrinkles quickly and smooth any type of fabric on the go. 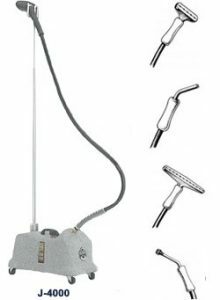 This 1500-watt garment steamer is equipped with a 360 swivel multi-hook hanger for flexible use. It also quickly heats up in seconds which becomes ready to use in less than a minute. Its multiple steam settings allow you to adjust the amount of steam output, depending on the fabric type you are handling. The product also comes with a double insulated hose that is helpful in maintaining steam temperature and regulating surface heat. The product’s multi-hook hanger makes it easier to steam any side of the garment while allowing you to steam multiple garments at the same time. Its silicon base gives you stability while you hang and steam your clothing. What’s more, the package comes with a pants press and fabric brush that you can use for your convenience. This easy-to-use garment steamer has a closed outline design for water spill prevention. Its handle is also designed in a way to make it easy to hold and comfortable to carry. It comes with a fabric and dust brush to assist you in cleaning and removing unpleasant odors from your clothing, linens, upholstery, and curtains. Made with ABS and PP material, this product can be heated and cooled without significant degradation. The steam outlet holes and water reservoir, on the other hand, are heat-resistant. It can heat up water in only 2 minutes and is designed to help prevent water from spilling while you steam your clothes. Even if the steamer is small in size, it can give off quite a lot of steam that can remove the wrinkles from any clothing quickly. The reasonably priced device would be a good buy, as it can help you save on both your time and expenses. This portable garment steamer is light and easy to pack, making it convenient for use when traveling. It easily heats water up which can help you save time whenever you are in a rush to work or on your way to important meet-ups with clients. The package also comes with a brush that you can use for removing lint and dirt, keeping your clothing, mattress, covers or carpets clean and germ-free. This item can be your perfect travel companion, as it is portable and easy to bring along anywhere. Its fast-steaming components are also a plus, especially when you have limited time on your hands to get rid of the wrinkles on your clothes. It can do its work efficiently in getting rid of clothing creases in all places. Its advanced nozzle design not only gives a powerful but also evenly distributed steam that can quickly remove wrinkles from a variety of fabrics, such as clothing, bedding, table linens, and drapery. It also has a safety protection feature that auto-shuts off the steamer once it detects that a temperature is too high or when the water level is too low. It gives continuous steam that can last 8-10 minutes with an easy-fill water tank. This product is perfect for individuals who constantly travel since it is light, easy, and compact-sized. You also do not need to wait for a long time for the water to heat up, since it only takes two minutes or less to get the steam running. It is a powerful device for such a small-sized product. 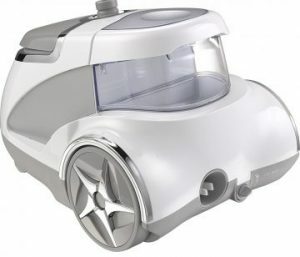 With its 1500-watt and 1.8-litre removable water tank, the steamer can give you great power and 60 minutes of continuous steam. This can effectively get rid of wrinkles from clothing, upholstery, curtains, and others. It is also equipped with a 4.6 ft. double insulated hose that is useful for maintaining the steam temperature, while regulating hose surface heat. For smaller garments, you can use its fold down hanger bar. Equipped with side hooks and hanging clips that can hold additional pieces of garment. The garment steamer’s strong power can quickly straighten out wrinkles. Because of its huge water tank size, it does not require you to constantly refill the water when steaming a good number of clothes and other items. Its built-in multi hanger and dual hanger levels are also very useful for pants and for hanging your clothes. 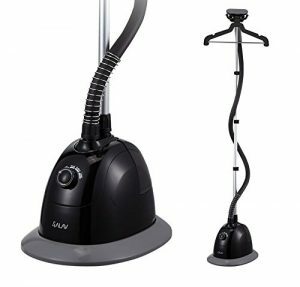 Versatile and heavy-duty, these are good reasons that the SALAV Professional Series garment steamer is the No. 1 choice. At this point, you already know the types of garment steamers as well as the best models available. With one simple device, you can easily remove wrinkles, restore the shape of a garment, and even get rid of unpleasant fabric odors. It won’t burn your favorite clothing either, and it is gentle in handling any delicate fabric. Whenever ironing can be such a hassle, you can always choose the more convenient garment steamer. Make the best choice.